The words on the vocabulary list are available in sets of fifty as flashcards for practice on the Wordchamp site. Aeneas, a Trojan prince who escaped with his followers when the Greeks captured Troy, is telling his adventures to Dido, queen of Carthage, to whose African kingdom he has been driven by a storm. He describes how, after the Trojans have pulled the Wooden Horse into their city, the Greek fleet, which had been in hiding at Tenedos, not far from Troy, sails back and lights a signal to tell Sinon to unfasten the Horse and let out the Greek soldiers hidden inside. Aeneas himself dreams that Hector, who had been killed in battle by Achilles, appears and tells him that the Greeks are in the city and that he must flee before it is too late. He awakes to hear the sounds of fighting and destruction in the distance. He goes up onto the roof of his father’s house to see and hear better, but then decides he must join the fight and die in battle. Amidst Creusa’s desperation, flames appear from Ascanius’s head yet do not harm him and then a meteor flashes through the sky to land on nearby Mt. Ida. These signs convince Anchises that it is Jupiter’s will for the whole family to leave the city together. Telling other members of the household to meet them at the ruined temple of Ceres outside the city, Aeneas places his father on his shoulders, takes his son by the hand and tells his wife to follow them. After the destruction of Troy, the Trojan prince Aeneas leads a small band of survivors in search of a new home in Italy. Unfortunately, as they sail on their way, they get spotted by the goddess Juno. Juno hates the Trojans because of an old grudge, and because they are destined to become the Romans, who will destroy Carthage, her favorite city. Conspiring with the god of the winds, Juno whips up a storm, forcing the Trojans to take refuge in – you guessed it – Carthage. Luckily, Aeneas has connections. In fact, his mom, Venus, is the goddess of connections. She introduces him to Dido, the beautiful queen of Carthage, who is recently widowed. Venus gets Amor, the personification of love, to make Dido fall madly in love with Aeneas. That night, at a banquet in his honor, Aeneas tells Dido the story of how Troy was captured, and how he escaped, carrying his father, Anchises, on his back, and leading his son, Ascanius, by the hand. (His wife, Creusa, died in the chaos – making Aeneas single, too.) Next, Aeneas recounts his and his fellow refugees' wanderings over the sea, including their close encounters with various weird mythological creatures. Aeneas's story ends with the death of his father, Anchises. Aeneas and the Trojans end up wintering in Carthage, and he and Dido become an item. Then Jupiter gets worried that Aeneas is abandoning his destiny of founding a new city. He sends the god Mercury down to tell him to get moving. Aeneas does as he's told, and Dido kills herself. A storm forces the Trojans to land in Sicily – at the exact place where they buried Anchises a year before. While the Trojans hold athletic contests in the old man's honor, Juno convinces the Trojan women to set fire to the ships. Realizing that not everyone is as jazzed about going to Italy as he is, Aeneas leaves some people in Sicily and sails on to Italy with his A-team. Their first stop is Cumae, in the Bay of Naples, where they visit the Sibyl, a prophetess. She leads Aeneas down to the underworld, where he sees a lot of spooky stuff, talks with his father Anchises, and sees the spirits of future Roman heroes, waiting to be born. He also encounters Dido. He tries to talk to her but she rejects him. Fired up by what he has seen in the underworld, Aeneas sails to Latium. As it happens, Latinus, the local king, has received an oracle saying his only child, Lavinia, must marry a foreign husband; he offers her to Aeneas in marriage. The problem is that Amata, Latinus's wife, wants their daughter to marry the local prince Turnus. Seeing her opportunity, Juno sends a Fury down to make both Amata and Turnus crazed with rage. Then she tricks Ascanius into shooting a stag kept as a pet by Latinus's gamekeeper. This provokes a war between the Italians and the Trojans. While the Italians are gathering allies, the god of the River Tiber appears to Aeneas in a dream and tells him to make an alliance with the Arcadian King Evander who lives upriver. Aeneas does as he's told and Evander lends him some troops, including his own son, Pallas. He also tells Aeneas to join forces with the Etruscans. After Aeneas sets out to speak to them, Venus comes down and gives him some armor made by the god Vulcan. It is decorated with scenes from the glorious future of Rome. Meanwhile, in Aeneas's absence, Turnus and his men attack the Trojan fort, but are unable to capture it. That night, two Trojan warriors, Nisus and Euryalus, try to break through the Italian lines to reach Aeneas, but end up being killed by an Italian patrol. Two days later, Aeneas arrives with his Arcadian and Etruscan allies. In the battle that day, Turnus kills Pallas. The next day, Aeneas and the Italians agree on a twelve-day truce to bury their dead, but it is broken three days later. The ensuing battle leads to the death of Camilla, a warrior queen allied with Turnus. That evening, Turnus decides to fight Aeneas one-on-one for Lavinia and the kingdom. Unfortunately, the next day, when they are about to fight their duel, the nymph Juturna (Turnus's sister) provokes one of the Italians to throw a spear at the Trojans, starting a new battle. After much fighting, Aeneas finally comes head-to-head with Turnus and wounds him with his spear. As Turnus begs for mercy, Aeneas considers sparing him – until he sees that Turnus is wearing a belt he stole from Pallas. Enraged, Aeneas kills Turnus with his sword. A recording of the whole of the Aeneid which can be listened to on-line or downloaded from the Libri-Vox site. The reader often stresses the first syllable of a foot, even when this does not coincide with the normal pronunciation of the word in everyday speech and he thus goes against the mainstream view that word accent and metrical ictus were independent of each other except for the last two feet of a normal hexameter verse. However, this method does help bring out the metrical structure and his pronunciation is generally good. The Dickinson College Commentary on selected sections of the Aeneid does not cover Book XII but includes valuable information on the poem and its reception generally, including recordings of Renaissance musical settings of some of the verses. Another potentially valuable source of help is `Aeneid: Text and Resources', part of the `Virgil Project' section on the University of Pennsylvania site. This is supposed to include a complete text of the Aeneid with glosses and syntactical information hyper-linked to each word, plus a number of commentaries and translations. However, this was still incomplete in summer 2013. 3. A Powerpoint on the Trojan War and Aeneas. 4. A summary of the plot of the Aeneid in the form of a spoof Facebook page. ​6. An introduction to the metre of the poem, the dactylic hexameter. The best edition of the text for IGCSE readers is Peter Jones' recently published Reading Virgil, which includes the full text of Books I and II of the poem with extensive introductory material and notes with special help for vocabulary. I will be drawing on it and older work for handouts I will be producing but it would be worth students looking at the book themselves. A preview is available on Amazon, though for actual purchase Bookdepository is cheaper as this site does not charge for delivery. Also still useful is the edition of Books I - VI by Clyde Pharr, originally published in the 1930s but still available in a reprint edition. This has a vocabulary with notes on the same page underneath each section of the text. 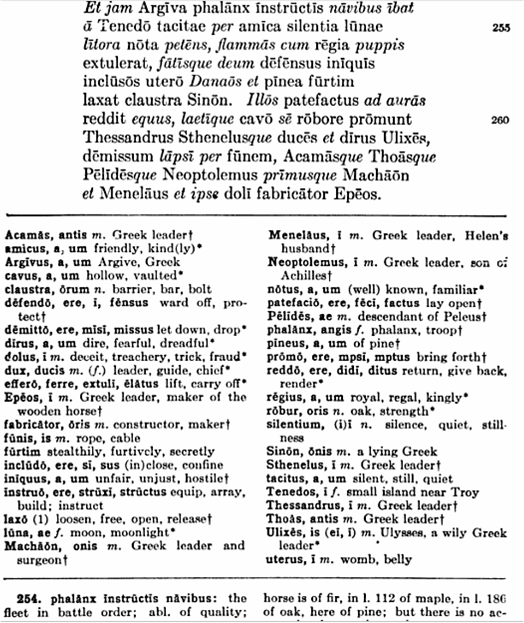 The individual page vocabularies are fuller than those given by Jones but still exclude the commonest words, which are contained in a pullout appendix at the back of the book. Jones, on the other hand, provides fuller notes. A preview of Pharr's work is available on Google books. PDFs of the general vocabulary (something over 300 words) and of the text and notes for Book II can be downloaded from a New York school's website. The 1960 commentary on Book 2 by R.G. Austin is probably still the most detailed and authoritative discussion available but contains much more detail than a student at GCSE level requires. 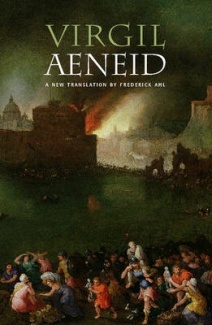 Finally, a good choice for getting a feel for the whole of the Aeneid is the translation by Frederick Ahl, which is not literal but manages to recreate some of Vergil's original rhythms and imagery. The anthology from which the extracts are taken, Two Centuries of Roman Prose, includes extensive background information and detailed notes. The paperback edition can be purchased from Amazon The file above gives the text as downloaded from the Bibliotheca Augustana, which may differ in one or two places. The Latin text as given in Two Centuries text, together with notes and glossing of all words not included in the IGCSE check list, will be provided in one handout and an English translation in another. Titus Livius (59 B.C. - 17 A.D.), generally known in English as `Livy', was, like Nepos, born on the plains of the River Po in what is now northern Italy but was at that time still known as Cisalpine Gaul (`Gaul this side of the Alps'). He produced a history of Roma `Ab Urbe Condita' (`From the Foundation of the City') in 142 `books', i.e sections that could be written on one papyrus scroll and which were roughly equivalent to 65 pages in a pocket-size modern volume. Most of the work has been lost though summaries of the contents have survived. Out of the original text, we now have just book 1-10 (covering the period from the legendary beginnings of the city down to 295 B.C.) and 21-35 (from the start of the Second Punic War in 218 down to 167 B.C.). 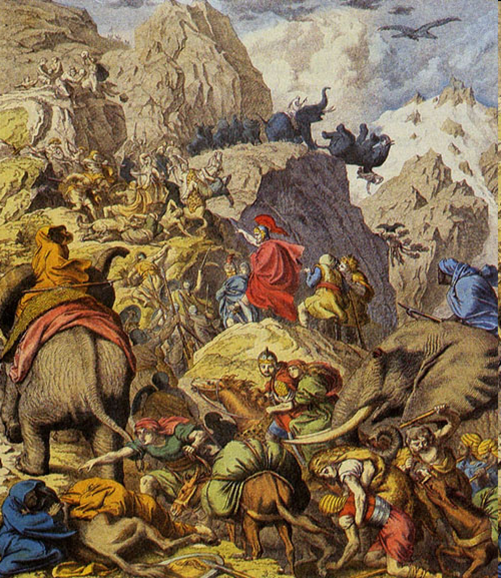 The extract included in the exam (from chapters 35-37 of Book 21) describes the Carthaginian general Hannibal's descent from the pass through which he crossed the Alps to invade Italy in 218 B.C. Over the next few years, Rome was almost brought to its knees but the war ended in 202 with the defeat of Carthage and Rome's emergence as the dominant power in the western Mediterranean, to which control of Greece and the eastern Mediterranean was soon added. Hannibal himself spent the last years of his life trying to help the Hellenistic Greek rulers against Rome until, fearing he was about to be handed over to the Romans, he committed suicide in c. 182 B.C. The exact route followed by Hannibal and his army, particularly the pass used at the summit, has been the subject of intense debate among scholars. Among recent discussions, Jona Lendering's case for the relatively low-altitude Col du Genèvre and Stanford University archaelogist Pat Hunt's argument for the higher Col du Clapier can be read on line. There is an excellent account of Livy and his work by Jona Lendering on the livius.org site and the Powerpoint draws on this and other sources to give a brief introduction as well as details on the general political background and the crossing itself. Canon Robert's `Everyman' translation of all the surviving books of De Urbe Condita is also available on line. A recent view of the clash between Rome and Carthage from the Carthaginian point of view is Richard Miles's Carthage Must be Destroyed: the Rise and Fall of an Ancient Civilization, which can be previewed on Amazon. The title is a translation of `Delenda est Carthago', the slogan used constantly by Roman statesman Cato the Elder until he got his way with the Third Punic War (149-146 B.C.) which ended with the total destruction of the city and the enslavement of its remaining inhabitants. An account of the Punic Wars by a prominent military historian is Adrian Goldsworthy's The Fall of Carthage, which can also be sampled on Amazon. Lucius Annaeus Seneca (c.4 B.C. to 65 A.D.), known as `Seneca the Younger' to distinguish him from his rhetorician father, was born in Corduba, the largest city in Roman Spain and educated in Rome and Alexandria before beginning a public career under four emperors - Tiberius, Caligula, Claudius and Nero. He was chosen by Nero's mother Agrippina as tutor to her son for five years from 49 B.C. till his accession to the throne 54 B.C. and then became one of the emperor's most important advisors with immense power over the administration. He later lost influence at court and went into retirement in 62 A.D. In 65 he was accused of complicity in a conspiracy against Nero and ordered to commit suicide - a common fate of courtiers whom emperors turned against. A full list of titles is available on Wikipedia. Seneca has over the centuries generally enjoyed a great reputation as a Stoic philosopher and source of practical advice for dealing with life's problems but he has also been accused by critics of not practising what he preached. As with his imperial master, Nero, it is impossible at this distance in time to judge how far charges against him are justified and how far they rest on fabrications by his political enemies. The extract prescribed for the exam is from his 56th letter to Lucilius and describes the noisy environment he endured while living over public baths but also arguing that the right mental attitude allowed a philosopher to cope with the problem. The role of baths and bathing in Roman society is discussed in detail in Fikret Yegül's Bathing in the Roman World, of which sample pages can be read on Amazon. A large collection of links on the topic is provided on the Cambridge Latin Course site. The PowerPoint below gives an overview of Cicero's life and works.